This was the kind of episode where I blink at the rolling credits, tilt my head back to look at the sky, raise my fist, and cry, "RRROOOTTTHHEENNNBBUUURRRRRG!!!!!!!" Mainly because it's the usual mixture of Stuff So Awesome I Want to Throw Confetti and My Face Is Not Big Enough to Contain My Sarcastic Palm. Hold up. You know what? This episode would be far better recapped as a series of scripted scenes. Moving on. Lexa: I want your people to be my people. Lexa: I have brought Ice Nation representatives here so we can calmly discuss why I'm better than they are. 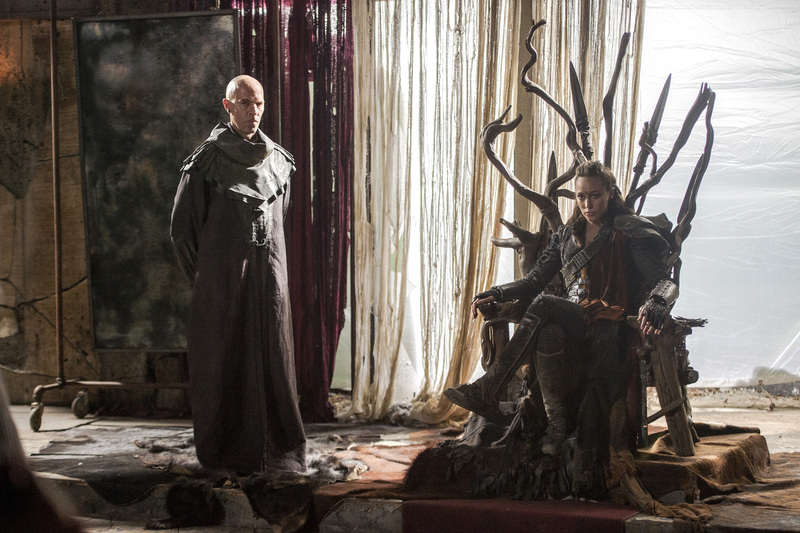 Ice Nation Dude: My queen is better than u.
Lexa: I want a word with you, over here, by this balcony, 800 stories up. Lexa: [Pushes him off the balcony and watches him fall to an untimely death] Oh dear, my hand slipped. Everyone: We saw that coming. Plot Device - I mean, Gina: Hey, Bellamy, I love you. I'm so lucky to be your girlfriend. Bellamy: Yeah, we're disgustingly cute together. Raven: Yeah, Sinclair loves me. Sinclair: Raven, you're doing everything wrong. Fix it. Octavia: Why are there people eating happily in the dining hall? Don't they know that like 300 people died here pretty recently? Pike: THE MORE THE MERRIER. Roan: Here's a weapon and a way to escape. You should use it and join my people. Clarke: Ah, cool, thank you. Echo: [Is dragged out of the woods by two Skaikru] Hey, Bellamy! Bellamy: Hey, girl I met that one time! Echo: That summit that everyone important is heading to is a TRAP. Bellamy: I totally trust you. Blind faith has never led me wrong before. WE'LL GO STOP IT. [Turns to Gina] Goodbye, forever girlfriend of 5 days. Gina: Be careful and safe. Kane: I love the city. Vendor: Here, have some mystery meat as a sign of my good friendship. Kane: Just eat the meat, Abby. Abby: You're so right, Kane. You should be Chancellor. Kane: You're right, but we should let the people vote on this because we need to give Pike a chance to be Chancellor and mess everything up. Abby: You're so right again, Kane. I don't know how you do it. Viewers: THE SMILING INDRA OF GOOD FORTUNE. REWIND. I MUST SEE THIS THING TEN TIMES BEFORE I CONTINUE. Lexa: I will kill you, tiny child who I am training. Tiny Child: I will kill YOU, Commander. Titus Tattooicus: We have to talk. Lexa: This kid is almost as good as I was. Those were the days. What did you want to talk about? Titus Tattooicus: Life would be so much easier if we just killed Clarke. Can we please do that? Lexa: Sorry, I was thinking about Clarke. What did you say? Lexa: I HEARD YOU WANTED TO SEE ME, MY SUN AND STARS, MY MOON. Clarke: I have a knife, but I can't kill you. Lexa: I'm not even going to ask where you got the knife; I'm too full of Clarke feelings. Also, your mom is here to see you. Abby: CLARKE. BABY. LET ME SEE YOUR FACE. Kane: You can see her face later. We have politics and things to talk about. Clarke: I have an idea. We're going to join Lexa's nation and become the 13th Clan. Lexa: Wonderful. And now the Chancellor of the 13th Clan needs to get a painful brand so everyone knows they're with me. Bellamy: I'M HERE TO CRASH THE CEREMONY. Bellamy: IT'S A TRAP. ECHO SAID - wait, where did Echo go? NOOOOOOOOOO, I TRUSTED HER. WHAT IS HAPPENING. Everyone: It would be cool if we could get these missiles to work, but we can't find the launch codes. Durza 2.0: [Creeps from the shadows of Mount Weather and stabs Gina, then enters the launch codes, which have been branded onto his arm] BTW Echo sent me. Lexa: I swear fealty to you, Clarke. Clarke: Just what I always wanted. Thanks. Ice Queen: Thanks to Emerson, the last surviving Mountain Man, my Evil Plan was put into action by Echo, my Faithful Subject! And now to rescue my son who, though banished, I seem to care an awful lot about. This is the show's third season, and while each season has evolved very differently, there are commonalities found in all of them. Last season, we left Clarke in a very dark place, which she's trying to come out of. This season, they're hinting that it's Bellamy's turn to enter said Dark Place, and I'm extremely concerned. Why? Because we had Bellamy's character arc begin to grow in season one, while Clarke didn't change much until season two. Bellamy's already been in his Dark Place, and if we take him there again, it's lazy writing - unless they do something drastically different. The writing is very obviously taking us toward Pike becoming Chancellor, which - while I love it, plot-wise - is extremely predictable and could be handled better. This being said, Roan is an incredible new character I'm very excited to see more of, and the show is at an interesting place that still has me really looking forward to each new episode. What did you think of the new episode? Any predictions for the coming season?